Everyday millions of small businesses in both Australia and around the world are dealing with unpaid invoices. In fact according to many government surveys the biggest issue businesses face is slow or late payments. When combined with the statistics and chance or recovering debt based on the amount of time that has prolonged then the issue of maintaining a positive cashflow can become very real. We often deal with customers because they are stressed, anxious and at their wit’s end when it comes to recovering a large amount of income. In the following post we are going to be discussing a number of strategies businesses can begin to implement to recovery debt quickly. How long to wait before contacting customers? It’s common for businesses to ask the question of “how long before I ask” and “how often should I be asking”. Business owners are often worried about upsetting their customers by appearing overly demanding for money that is owed so like anything you’ll need to find a balance that fits. At the end of the day however you are in business and business should not be handled in the same way you do when lending money to a family member or friend. Having positive cashflow is critical for businesses and therefore the answer to “how long” should be driven from inside your business ensuring you meet the requirements you’ve set. You should have a signed terms of trade in place that outlines your process for collecting on outstanding debts. This should outline any costs that will be incurred for outstanding accounts and the expectations for how quickly accounts will be paid. You might even include your frequency of follow-up for overdue accounts to ensure customers are well aware of your process. It’s often the case that customers have lost the invoice in their emails and simply forgotten to pay it. We recommend setting up automated reminders to notify customers that an invoice is still outstanding as soon as the due date is hit. In many cases you’ll find that the debt is quickly paid soon after and the automation can save significant time. 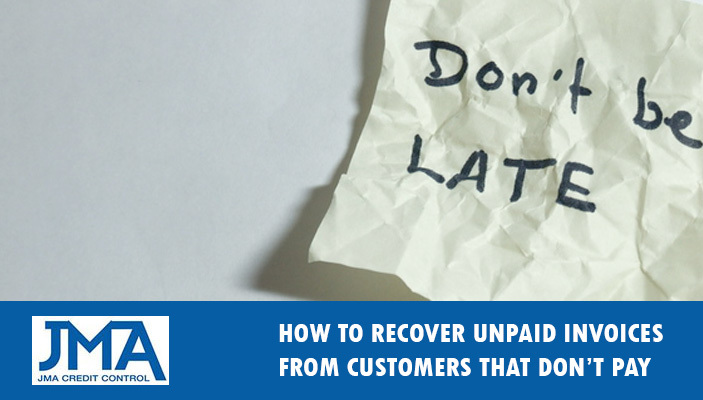 Businesses typically follow-up in 7 – 14 days to check whether payment has been made. After 3 months you have just a 74% chance of collecting unpaid debt so staying on top with your reminders gives you the best chance for success. Automated reminder emails are great for the majority of outstanding invoices and requires very little of your time however in some cases this simply won’t be enough. When it comes to email nothing is guaranteed either, you might find that your email is arriving in spam or the customer is having mail issues on their side. However If you’ve sent your initial reminder and the debt is still unpaid then it’s time to review the facts and give you customer a call to see whether there are any issues around making payment. If you have multiple trading terms in place ensure you know which one your customer has signed and agreed. With the right accounting system the majority of the above should be fairly simple and will get you the facts within a few minutes. More advanced applications might also show details such as the average time to pay per invoice or historic information of overdue debt and delayed repayment. Data is empowering for your accounts team to be able to deal with each unique situation and provide options for customers struggling to pay. Debt collection letters are a final notice to the customer notifying that the account is overdue and despite all prior attempts it will now be referred and may result in legal proceedings. Here is an example of our debt collection letter which is freely available for you to download. We refer to the above and advise that despite our previous reminders your account is now well overdue and remains unpaid. 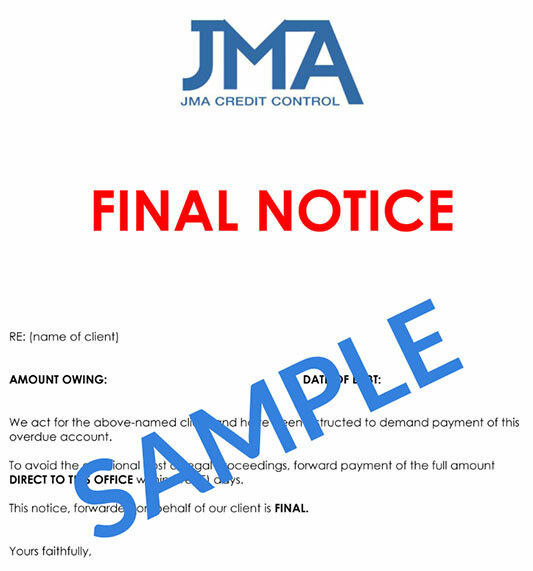 We therefore advise that unless arrangements are made within 5 days to pay the full amount owing, we will be forced to refer the matter to our collection agency – JMA Credit Control. If legal proceedings are initiated against you this may involve you in further costs and may prejudice your future credit standing. If you have any query in relation to the account, please contact us upon receipt of this letter. A letter of demand gives your client the opportunity to pay the debt without spending the time and money associated with legal proceedings. Keep a copy of the letter of demand you send the client as it may be required as evidence that you tried to recover the debt if you proceed with legal action. When drafting a letter of demand you must not harass the debtor or design it to look like a court document when it’s not.. These debt collection practices are illegal. The ACCC website explains your legal obligations when recovering a debt and we’ve also spoken about Australian debt collection standards which go into further detail about some of the do’s and don’ts. We recommend if you have any concerns to seek legal advice before proceeding. warn that debt recovery options will be pursued if payment is not received by the nominated date. We’re always shocked to find how often business owners write off debt that is perfectly recoverable. Collecting debt can be stressful and at times it’s easier to jump the gun and just write it off as bad debt. Hiring debt collectors can also be stressful and make you feel like you’re being aggressive or desperate for your money. That’s very much not the case and most of the time debt collectors, due to their experience, can regain your money faster while significantly reducing your stress. Most debt collectors offer flexible debt collection fees and in many cases “no collection, no fee” so at the end of the day the risks are very minimal to your business and payment for services becomes a percentage of the money that is outstanding. This is a win-win because currently there is money outstanding that you’re close to writing off as bad debt so it makes sense to assign a portion of the outstanding debt in the hope that you’ll regain as much as possible. It’s can also be seen that using a debt collector may have a negative impact on your relationship with the client. Any good debt collection agency should perform their task without you having to lose a customer. Like any industry there are rumours about poor and aggressive tactics that can sour the relationship between you and your client but majority will conduct business on your behalf like it was their own and maintain a strong and professional relationship. You should not hesitate to employ a debt collection agency, as you should have the right to charge your customers for the costs if you have included this in your ‘Terms of Trade’. I am trying to get a collection for a 120 days customer ….a well established customer..
Do you mean the debt has been outstanding for 120 days? The collection success rates drops significantly between the 3 – 6 month period. Take a look at some of the other content we have on our site which will provide you with plenty of information on how you can request outstanding amounts politely and professionally. If you’re still unsure please contact us to see how we can help you. A sole trader contractor declared bankrupt and stopped the work in between. What rights we have to receive our money back or force him to complete the job? Hi I have been waiting months and months for 2 invoice payments from a client. I’ve emailed, messaged and called with no success getting through to the client.